Located in rural Madison County, about 5 miles south-southwest of Earlham, the Early Chapel was founded in 1875 by a group of like-minded citizens who began gathering in local homes to practice their faith. When meeting in homes became impractical, they moved their services to the Jackson Township schoolhouse. Originally called the North River Church, the name was changed to Early Chapel when land was donated by the Early family to erect the first permanent church building in 1890. That building was destroyed by fire due to a lightning strike in 1915. A second church was erected and dedicated in May of 1916. It too was destroyed by fire in 1965 after which the current structure was built. Services are still being held there today. The following is a brief history of the church that was composed for the dedication of the second building in 1916. 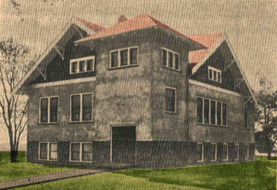 The congregation, which came to be known as the North River Church of Christ, was organized at the school house in District No. 1, in Jackson Township, June 20, 1875, under the leadership of Brother Gaston of Des Moines. The first Christian preacher was Brother Mark Roberts, who preached as early as 1865; and Elder Dodge of De Soto, was also an early preacher. There had been occasional preaching for two or three years previous to this date; Brother Dolbar perhaps being the first, followed by Brother Cheatham, who was located at De Soto. After the organization, Brother Boles, Brother Brown and Brother Wilson preached more or less regularly and held special meetings. Of the thirty names on the church roll at the time of the organization, less than one half dozen are now living, and they are unable to recall the early church history in detail. The records which had been carefully preserved in the church library, were burned when the church was destroyed by fire. Those of the charter members who are living at this time are: Mrs. Israel Miller (Syntha Anna), Mrs. Jack Davis, Mrs. Henry Davis (Lucinda Ellen), Mrs. Minerva Wolverton, and Mrs. Laura Early. One of the members and early ministers, who will be affectionately remembered, was Brother Henry Davis, who was ordained by Brother Dolbar. As the congregation grew in numbers and strength, it was resolved to build a house of worship, accordingly a church was erected in 1890, and dedicated in August of that year; Brother Ellis of Rising Sun, preached the dedicatory sermon, assisted by Brother D. M. Haggard of De Soto. Among the men in the church at that time, Otto Bruett, Thomas Hays, Isaiah Henry, William Babbitt, and Benton Applegate will be remembered as leaders and officers. From the above date, 1890, the preaching was supplied almost entirely by students from Drake University; among them we recall Edgar Price, C. L. Pickett, W. A. Brandenburg, Dean Sherman Kirk, Dean J. Mad. Williams, john Booth, J. David Arnold, Edwin Priest, Charles Blanchard and many others, which time and space forbid mention. Our church home was destroyed by lightning the night of June 9, 1915. During the two and one half decades between 1890 and 1915, we have steadily grown in numbers and strength. We have experienced the same extremes of inspiration and depression common to rural churches but through all we have constantly moved forward, and when our church home was destroyed, the sentiment almost universally expressed was "Let us build again". Accordingly a committee was named, consisting of Clarence M. Eppard, John T. Williams, Asa L. Moore, Jesse Leeper, Alpha W. Callison and Chester L. Jones, and the results of their labors, together with he entire membership and many friends of the church who have cheerfully assisted in every possible way, bring us to the present. who scanned and submitted it. This page was last updated Thursday, 04-Apr-2013 16:27:09 EDT .